Enter the Vertiguys! 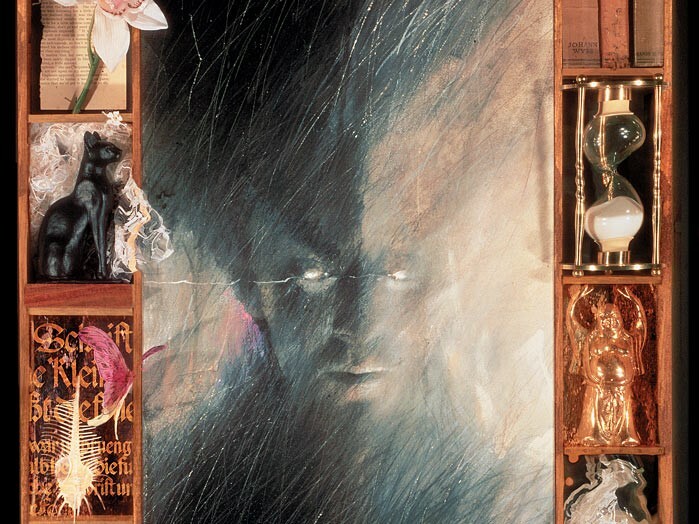 For our first sojourn into the dark side of DC, we’re talking about 1989’s The Sandman #1, and getting to know Neil Gaiman’s mercurial protagonist Morpheus: King of Dreams, Lord of Imagination, Infamous Chicken Thief. 0:55 – An important correction! The colorist credit in the trade paperback is correct: Daniel Vozzo did the recolor. The original colors were by Robbie Busch. 2:12 – For the first five issues, Sam Kieth penciled and Mike Dringenberg inked. 3:18 – Correction: Neil Gaiman’s first Marvelman (a.k.a. Miracleman) story was in 1989, right around the same time as Sandman #1. He came back for a longer run on the character in 1990, concurrent with the Sandman series. 3:30 – Black Orchid is a female superhero created in 1973 by Sheldon Mayer and Tony DeZuniga, known primarily for her mastery of disguise and for not having an origin story until Neil Gaiman wrote her one. Gaiman’s 1988 Black Orchid miniseries opens with the heroine being unmasked and murdered by a criminal she was investigating, leaving her sister to take on the role in her place. 3:54 – Wesley Dodds first appeared in June 1939 – just a few months after Batman – and was created by Gardner Fox and Bert Christman. As well as putting people to sleep, his gas gun could compel them to tell the truth. 14:29 – That’s a reference to one of Eric’s favorite bad movies, Under Siege 2, in which those words are delivered by Steven Seagal to a mook via a text message setting off the bomb the guy’s holding. It’s a hell of a movie. 21:10 – Later, another demon claims to have obtained the helmet in trade from a mortal, but it’s Beelzebub who has the distinctive speech pattern – and speech bubble styling – seen here. 24:35 – In the classic stories, Wesley Dodds actually did suffer from nightmares, prophetic dreams that gave him vague clues to crimes. 33:40 – Majorca is a large island in the Mediterranean. It’s part of Spain and, as Frederick’s fantasy implies, a massively popular tourist destination. 33:49 – Henna is a plant-based dye used for temporary tattooing and other cosmetic purposes in North Africa, South Asia, and the Arabian Peninsula. 42:51 – Sam Kieth had already inked Matt Wagner’s legendary Mage. He went on to plot and draw all 35 issues of The Maxx. He’s also drawn various Batman projects since 2006. 43:00 – I mistakenly referred to The Maxx as Bill Messner-Loebs’ series. He definitely had a big hand in it, but I don’t want to minimize the role of Sam Kieth, who created, plotted, and drew the series, while Messner-Loebs wrote the scripts for all but two of the first 23 issues. 44:05 – We forgot to mention the credits for Savage Things #1: it was written by Justin Jordan and drawn by Ibrahim Moustafa, with a cover by John Paul Leon. 48:45 – I made the comparison to TV’s Hannibal, and the novel Red Dragon, particularly due to the presentation of sociopathy as a superpower in Savage Things. Red Dragon similarly revolves around a sort of killer instinct or murderous urge as something that characters – especially protagonist Will Graham – can leverage to understand and combat other people who share the same compulsions.